World's auto major, Volkswagen is mulling over to introduce the new second generation model of Volkswagen Touareg soon in India. However, the company has not yet officially announced the launch of new Touareg in India, but as per some auto news sources, the new Volkswagen Touareg is believed to be launched in the Indian auto market in the end of this current calender year or early next year. The second generation Massive SUV comes with more fuel efficiency compared from its already existing model in the country. Volkswagen is allows to import the new version of Volkswagen Touareg with the options of V6 petrol, V8 petrol and the V8 diesel engine. Right now, has not been made clear that which model will come first in the auto market. The company currently selling a large numbers of popular cars in India that includes Volkswagen Beetle, Volkswagen Jetta, Volkswagen Phaeton, Volkswagen Polo, Volkswagen Vento and Volkswagen Passat. All the model of the company are getting wonderful attention from the Indian buyers. The new version of Volkswagen Touareg might be launched with advanced attributes to make it more classy and comfy. On the other hand, Volkswagen is also intending to introduce the Touareg SUV in Hybrid version in the International auto markets. 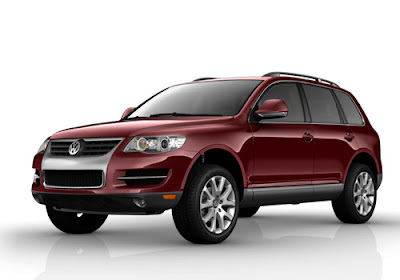 The existing model of Volkswagen Touareg is priced at Rs. Rs 51,85,000 - Rs 51,85,000 (ex-showroom,Delhi), while the new version will be more costlier then the old horse. The company presently is getting huge demand of newly entrant Volkswagen Polo and Volkswagen Vento from the Indian buyers. The Polo was launched in previous year with attractive price tag between Rs 4,34,000 - Rs 6,70,000 (ex-showroom,Delhi). Apart from that launch, Indian car lovers will get new cars in India that includes Skoda Yeti, Volvo XC60, Maruti Kizashi, Toyota Etios, Hyundai Avante, Maruti Cervo, BMW X1, Chevrolet Volt and more.